Preparing your taxes can be quite a process, especially if your financial life has changed significantly from the previous year. When preparing your taxes, it’s important to consider all of the items that may be deducted in order to save you money. Keeping track of all of the things that have changed for you financially in the previous year can get complicated, and sometimes it’s hard to know what exactly you need to track down before filing your taxes. This document is designed to quickly give you an overview of which aspects of your finances may affect your taxes. Simply answer the questions in the document to get organized and determine which materials you’ll need to gather prior to filing your taxes. Submit the form to download your free copy of this free tool. 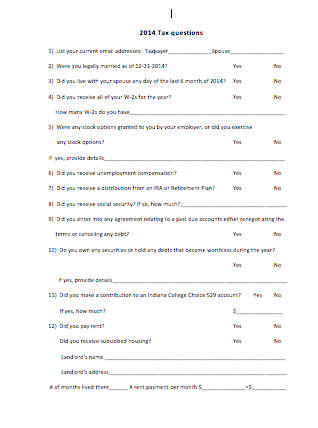 Please note: the current document is intended to help with the 2014 tax year. We’ll update the document later this year when 2015 tax preparation begins.